The Horror Honeys: ARE YOU AFRAID OF THE DARKO? ARE YOU AFRAID OF THE DARKO? Hexmas season is over, but the chilling spirit of the holiday lives on, and this Sci-Fi Honey is still visiting and revisiting films that find their zenith on this mystic time of year. 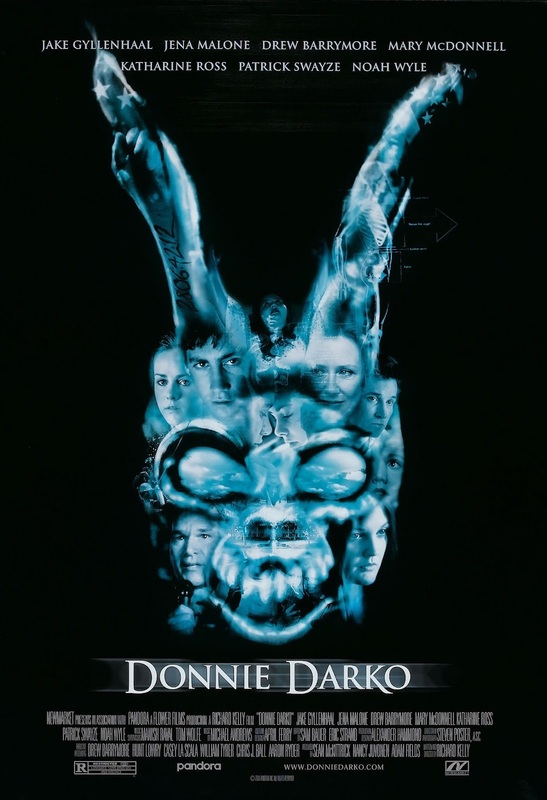 Opening at the beginning of October and culminating on All Hallows Eve in 1988, Richard Kelly’s 2001 time travel mind-trip Donnie Darko is a mashup of horror and drama with a cool indie/sci-fi edge that’s elevated the film through the last decade to certified cult-classic status. In case you missed out on attending any sleepover, dorm room or midnight theatrical screenings over the past thirteen years, I’ll give you a plot recap: the titular Donnie, played by a young Jake Gyllenhaal, is a moody and morose kid who sleepwalks through the travails of his upper-middle-class suburbanite existence. Donnie regularly attends therapy to recount visits by an imaginary friend named Frank – a one-eyed teenaged kid in a bunny suit, and fuel to your nightmares. Frank tells Donnie to “do things,” and they’re not all pleasant undertakings. Donnie goes the way of Alice – literally and figuratively through the looking glass – and finds himself traversing an alternate reality, where his living or dying profoundly effects the lives of everyone in his community. … and the hearts of teenage girls everywhere. You probably first saw this movie when you were a teenager or young adult, and you thought: “this movie is deep. And I’m deep for liking it.” You probably wrote “cellar door” on your favorite notebook. You probably hugged your pillow and sobbed along to the melodic emo-despair of Gary Jules’ “Mad World.” You probably traded theories with your friends about the philosophy of time travel and stunned them with your pseudo-scientific intellectual prowess. You probably even thought that you understood Donnie Darko – I did too, until I read this. Whether you’re right or wrong, for me, this film is not about having all the answers. Time travel stories and films by nature are imbued with so many logical absurdities, one can never truly have a foolproof time travel plot – there are always questions, loopholes, and double negatives. What makes this film a profound work of art is not the content of the story itself, but the unique look and feel of what is being depicted onscreen. In fact, if you looked closely at the plot you’d come up with a laundry list of flaws – so why not just sit back, relax, and revel in parallel dimensions scored by emotional 80s Britpop? While primarily billed as a drama/mystery/sci-fi endeavor, the horror references in this movie are hard to ignore, which makes this movie an essential addition to anyone’s annual Hexmas film playlist. Frank’s otherworldly presence makes him an iconic supernatural cinema spook, a boogeyman that treads the line between reality and nightmares. The entire film is laden with references to other works of horror, from the eerie white noise of a static-screened television (Poltergeist), to the older sister’s reading of choice (Stephen King’s It), to Donnie’s pre-Halloween trip to the cinema to catch a screening of The Evil Dead. Perhaps the biggest influence on Kelly’s directorial approach, however, comes from The Shining auteur himself, Stanley Kubrick. Kelly’s choice of tracking shots and slow dissolves between scenes are a clear reference to Kubrick’s style, but no allusion to The Shining is clearer than Donnie’s own glowering, Jack Torrance-esque stare. Donnie Darko was writer/director Richard Kelly’s arthouse masterpiece, fueled by a spark of originality he wasn’t able to evoke in his subsequent features; both Southland Tales (2006) and The Box (2009) collapsed under the weight of Kelly’s buzzworthy reputation for bringing something thematically bold and irreverent to the screen. A barely-related sequel, S. Darko, also emerged in 2009; but as the Rotten Tomatoes score will confirm, it scarcely deserves a mention. Faring better from the Darko revolution were the film’s breakout stars, primarily Gyllenhaal, who is getting serious Oscar buzz for his latest film, Nightcrawler. Also featuring roles from indie darling Jena Malone, Jake’s sister Maggie, and a young (but still obnoxious) Seth Rogen, the young cast is buoyed by some recognizable pros, including Patrick Swayze in a daring turn as a motivational speaker with a dark secret. Sprinkle in a killer 80s soundtrack featuring Echo & the Bunnymen, Tears for Fears, The Church, and Joy Division, and you’ve got the makings of a trendy emo-indie classic. Thirteen years, one director’s cut and one rabid cult following later, Donnie Darko has not lost its unique tone or vision. It remains a singular cinematic experience perfect for any gloomy evening in October – just don’t watch it in bed, lest a jet engine comes crashing down on you. Sci-Fi Honey Rating: Four spooky bunnies out of five.